I started writing this on the train back from Norway a couple of days after Hack4NO but I never published it. Now when I’m rewriting it I’m in Norway for the second time this month. I first went to Norway June 4th, I had three days with orienteering, girlfriend and mapping(also known as everything/everyone I love most). In addition I had two other great days at Kartverket/Hack4NO. My only goal there was to meet people and checkout the Norwegian community for the future. I did meet a loot of great people and had a great experience! My plan was to work with something related to culture and maps, that didn’t happen(I did spend quite a lot time of my time on maps/related(don’t believe anything else)). During the idea pitching I abandoned my idea in favor of something else with great possibilities. Me, Alice Polenghi, Davide Rapotez, Peter Bremer og Bjørn Hjelle worked on the project BioPin.it. It isn’t the most simply idea. The user collects images together with location and timestamp data of animals, plants, fungus and so on when you(the user) observes them. BioPin.it then haves a simple interface for deciding what specie you have found and this could also be crowd sourced by other users. You then gains points based on other users liking your images and if your observe is unique, we could have a lot of stuff in this part and we have many ideas. Marking up meta data is a big thing we looked into. The fact that we ended up winning the “Best Use”(some what freely translated) category isn’t a mystery. We have all the parts a jury at a open data event cares most about. Our process of getting something done in less then two days is quite interesting, we did spend the first six hours on just the idea and the scoop. We started working on the entire platform directly, it was impossible for us to have something finished to show on the presentation. We was able to get some data mining done, we was able to set up a API for this data, we was able to build a web interface for selecting species and we had some great designs of what a mobile app would look like. So we won a day with at Making Waves and the week after we was one of the two teams winning a trip to Slush in September. Two days ago we had that day at Making Waves in Oslo. 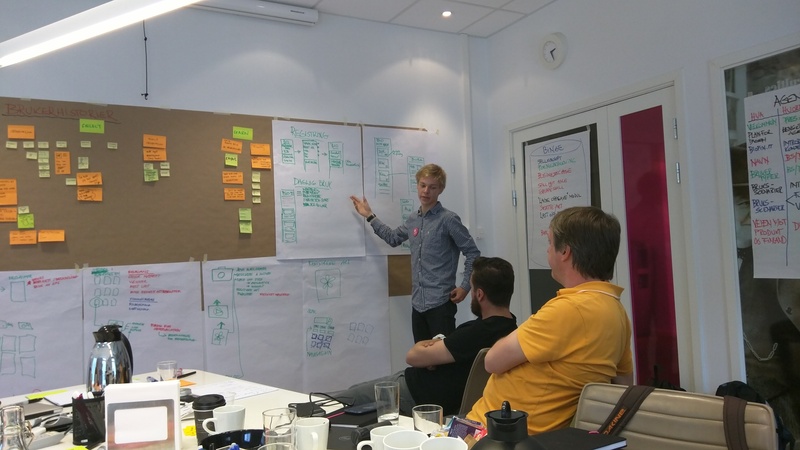 We was working with defining our idea, potential users, funding app flow and such things. It was a long day and the fact that I spend the three days before going to Making Waves competing in the Norwegian forests didn’t make it shorter. We had all settled down on the idea a bit witch felt calming. We did put all of our notes on the walls and it did not take more then a hour before the we picked down the first painting from the wall, at the end we had some layers of notes. I’m really looking forward to Slush in September and all the possibilities that the meta data generated by our project opens. Tomorrow I’m going back to Sweden and I go back to fill my live with work and training.